Earth Day 2008 in Second Life is being observed Saturday April 19 through Tuesday April 22nd (the official Earth Day). See the schedule and jump-off links for Second Life, below. If you are not yet a Second Life participant, joining is very simple, and is free, starting with the Second Life viewer download. "Effective Ways to Move Toward a Sustainable Planet"
--What kinds of education and awareness programs should we run to best use SL for positive influence on RL issues surrounding water? --What SL and RL organizations should we be working with to increase our and their effectiveness? If you are unable to join Delia this morning, please put your comments into this card, along with your avatar name and drop it on Delia's profile. The Center for Water Studies is a group owned site and would greatly benefit from your inputs. If you are inworld at noon, please join Delia for a tour of a most amazing build of alternative energy done by Bjerkel Eerie, one of our All About Water group members. If you are unable to visit the Energy sky island at this time, make sure to take it in another time soon. It's well worth a trip. If you visit Etopia (recommended - see below) during Earth Day or at any time, check out the build of an Aquaculture and Wastewater Treatment Facility by fishace Pye. Lastly, Earth Day is about our connection to the Real Life earth. Walk outside and let your senses fill with wonder at the majesty of our world. 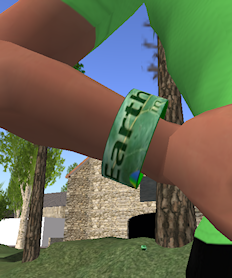 Thank you for being part of this group and ecological journey in SL. Earth Day 2008 will be celebrated in Etopia on Saturday, April 19th. On this day we will be celebrating all that is good about the Earth and what we can do as individuals and as a community to help insure a healthy world for future generations. This date will also be the first anniversary for Etopia Island so come celebrate with us! "A Global Vibration To Honor The Earth"
11am Drumming Circle @ - during the Earth Day schedule, a drumming circle will be held at 11am each day.